This three-day symposium had a distinct focus on the relationship between Drawing and Time, which is where the themes and ideas explored overlap and intersect with this edition of Interalia Magazine. Working closely with the invited speakers, as well as Hardwick gallery curator Sarah Bowden and Re-searcher in residence Lucy Gresley, the symposium used these two simple words, Time and Image, as a vehicle for expansive thinking around our complex contemporary experience of Time, coupled with our understanding of the way images communicate and inform our everyday. This gave us a framework to probe questions about how we read and understand the medium of Drawing as a distinct form of image making within a contemporary culture saturated with images, breeding multiple image hierarchies and agendas. Within the framework of such questions the visual work, as well as the thinking and making processes of the invited artists and speakers, formed vital reference points to the themes discussed, reflected upon with the seventy or so invited audience members which included both staff and students of the University, as well as interested members of the public. In initiating collective thinking around this area of research through the symposium, my hope was to incrementally build on this established body of knowledge and understanding, with new realisations through a focused, yet open and discursive approach. The backdrop for the symposium in terms of my recent research would be best located through pointing towards a text I completed around this time last year entitled Drawing is Political? (an early version of which was published by Interalia magazine in March 2017). In addition, it would be important to mention The Politics of Seeing conference I devised and organised in June 2017 with invited guest artist and academic, Dr Gill Gibbon. Gibbon is perhaps most noted for her remarkable Drawings covertly made at arms fairs revealing the hidden activities of those buying and selling nuclear weapons. Alongside my paper The Politics of Seeing, Gibbon delivered her extraordinary paper, Drawing the Panopticon; Representation, Resistance and Surveillance, which included a number of references to Drawings she made from direct observation at arms fairs in both London and Dubai. Co-incidentally rather than purposefully, both papers made more than one reference to the late John Berger, underlining a clear cross over in thinking. Gill and I both used the historical associations of Drawing as a means for looking (as in Drawing from observation), as a conduit to discuss the political, ethical and moral frameworks around how we look and see today, within the complexity of our highly mediated times. This inevitably involved re-visiting and re-framing ideas originally explored by Berger in his seminal text of 1972, Ways of Seeing. As already suggested, the politics of how we see is now intertwined with the politics of how we capture (and share) the images which narrate our lives, which has clearly changed hugely since Berger’s original text. The extent of this change post Way of Seeing, is of course too seismic and profound to convey in any substantial way in this short article. But it seems impossible not to briefly acknowledge the impact social media has had in recent years, as we recognise its seemingly effortless ability to dictate how the narratives that define our lives are framed and relayed back to us, from the personal to the collective, social to political, local to global. A particular aspect of this which was referenced a number of times during the symposium was topically the relationship between data mining, psychological profiling, political campaigning and images (political targeting through platforms such as Facebook, for example). This has been most readily illuminated through the media coverage of Cambridge Analytica’s activities in relation to both the UK EU referendum campaign, as well as the US presidential elections of 2016. The impact that the multiple narratives of images we experience may have on the political choices we make, was discussed in relation to a broad range of sources during the symposium, with reference to a number of prominent researchers. Within my introduction to the theme of Image, I discussed the multiple image economies surrounding us in our everyday, noting a discussion which took place at the Photographic Universe and Political Agency conference between artist/academic Hito Steyerl and political scientist Victoria Hattam. Steyerl’s introduction focused on how and why the reality we live in consists of images, which Hattam expanded upon by contextualised these ideas in relation to her own research. Through this reference I was able to illustrate a framework of thinking offered by Hattam’s work which seems highly relevant to understanding the impact of the image driven political campaigning by Facebook and Cambridge Analytica. ‘I have come to think that a lot of the work behind political subjectivities take place visually, the idea being that our everyday looking, what we see when we walk down the street, flick through a newspaper or look at google images sets the horizon of political possibilities, everyday looking inadvertently establishing’s the sense of where affinities are to be found, and differences lie. It is these presumptive identifications that set the ground of politics for me’. 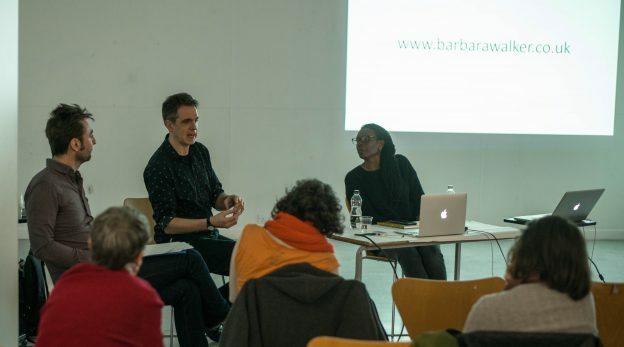 Dryden Goodwin, Barbara Walker and Jack Southern in conversation, March 2018 (Image credit, Karen Roswell). In turning my attention more specifically towards the theme of Time, it’s important to discuss the paper by Jean Boyd ‘Contemporary experiences of Time’. This echoed and expanded on much of my previous research, but crucially offered the most valuable ways we might consider notions of Time in the context of the symposium. This included a rich framework of thinking in relation to both the core themes and ideas presented, as well as the work of the invited artists. Boyd poetically illuminated the relevance of looking at the practice of each of the artists by referring to the concept of the decisive moment. We of course associate the increasingly instantaneous capture of a desired moment, with the progress and triumph of modern photography. (Although we might now more readily associate this with the relationship between phone/tablet cameras and social media platforms). Boyd suggested that the gap between human thought, vision and representation which the decisive moment has strived to close, might be exactly the space and Time that the artists in the symposium question, and open up. With this, Boyd seems to refer to the Drawing process of the artists’ works as a form of capture which incorporates a highly personal and distinctive decision-making process. Thus, allowing the subject matter of the works to acquire an agency with the conviction of the capture of the lens, but the sense of touch and sensitivity of the human and handmade. It seems highly relevant to extend the historical lineage of the concept of the decisive moment, to the artists’ political and ethical choices of what they may include or not, in the making of the image in order to convey their distinct subject matter. Boyd reflected on the similarities and distinction of the artists’ practices as an ‘enfolding to include other times or phenomena that unfold at different paces, or are unevenly distributed and unpredictable. Making visible forces that are never just in one place, at one time, and so evade simple representation’: the market, community, ecosystems, weather, geologies, gentrification, colonialism, hopes, our presence for others’. Boyd encouraged us to focus on the traces, textures and marks embedded within the works we looked at, as the evidence of a distinct set of temporal experiences, which not only allows us to question the nature of our experience of, and relationship to Time, but also encourages us to reflect on how and why our sense of Time feels the way it does to us in the now. And in doing so, beautifully and meaningfully extended the initial dialogues of the symposium around the ‘technological effects and consequences of our always-on digital environments’, to deeper considerations of the affects of this state, perhaps focusing on ‘the underlying emotional responses to living with-our-times’. Boyd perceptively identified that the visual and conceptual languages employed by the artists, all offer us different points of entry to consider the relationship between action, mark and Time. Allowing us to think about how art, and more specifically the medium of Drawing, responds to ‘the conflicting temporalities that we live with’. Perhaps enabling us to understand ‘how to be in our difficult present while simultaneously imagining (conjuring an image of) our futures’. Within the fertile musings of Boyd’s paper, she indicates that the image of our futures may further accelerate a prominent characteristic of our digital present, by framing ‘new temporalities, desires and fears of preservation and loss’, signifying ‘a new tension between past and future’. Through underlining the ‘apparently inexhaustible means to document our present’, she infers that our futures may be haunted by the accumulation of digital images of our past (and our former lives), leading us to question whether the ‘right to be forgotten’ is not only an ‘indicator of our time’, but may also become a legacy of it? With a flexibility of argument, Boyd also suggests the opposite, pointing out that as we live with data overload, we also live with the threat of data loss, stating ‘in a decade, technical obsolescence can render information and data inaccessible and irretrievable’. Crucially, Boyd points out that within this context, material traces, and notions of ‘permanence and ephemerality’, take on new meanings and values for us. I would add, that the visual qualities we can locate in the artists’ Drawings, those of subtlety, transparency, fragmentation, palimpsest and erasure, also assume a renewed relevance. And to return to Boyd’s point, ‘perhaps not coincidentally at a time when Drawing as outcome, rather than preparatory’ assumes and maintains a very particular significance. The assumption that the value of Drawing is dependent on its role as a material antidote to the ways in which we increasingly work across digital platforms, is clearly too simplistic. However, if we do acknowledge that Drawing has the capacity to be a means of recording personal and emotional reactions to the world in an instinctive and unmediated way, then Drawing can clearly offer us a different sense and experience of Time. A nature of engagement with the world which seems to increasingly evade us? In the tuition of Drawing, this alignment of concentration across seeing, exploring and responding through the Drawing process, has historically been discussed in terms of a synchronous experience; a moment of synchronicity between the eye, brain and hand, particularly when Drawing from observation of course. It was interesting to hear Boyd refer to the tensions of past and future expressed ‘as a tension between the polarities of synchronous and asynchronous’. Boyd elaborates by explaining that ‘we live in times of, and actively seek out social synchrony’, particular through social media, looking for a ‘togetherness in Time, if not necessarily in space’. Yet the temporal framework of the digital media we are constantly engaged with, means we battle the asynchronous nature of our on-demand live styles. ‘Everything available when we want it, no queue, wait or missed chances’ expectant of, as Boyd puts it, ‘our own individual now’. In Boyd’s closing statements, she quite literally extends our thinking, from the title of my previous paper ‘The Politics of Seeing’, to ‘consider art as a politics of seeing with many times, not just our own, calibrated to acknowledge many scales and paces, and levels of visibility’. Whether we are striving for synchronicity in the act of Drawing, or in-fact in the process of navigating the multiple Time scales of our complex lives, the poignant analogy seems to extend to the metaphor of the making of an image, as we consider whether the rendering represents, preserves or erases it’s subject/s. Which is where this symposium, and subsequent writing of this article has raised new and interesting questions for me in considering ‘the resilience of Drawing as a means of responding to contemporary questions of representation and dialogue’. Adopting the theme of Time as means of exploring these ideas has enabled me to progress my thinking around how Drawing, as a very particular means of making an image sits within the vast sea of methods of image production today. But crucially, it has harnessed my attention back to the process of making, rather than predominately focusing on the Drawn image as outcome. The political embedded in the actions, intentions and decision-making process intrinsic to the making of a Drawing, in addition to thinking about the politics of how the drawn image as document may be seen, understood and disseminated. This leads to a further consideration of the relationship between the political and ethical dimensions of how a Drawing may be seen, and how a Drawing may be made; the relationship of the onlookers’ eye, to the artists/makers eye. I have to credit this to the extraordinary sessions within the symposium in which the invited artists were extremely generous in discussing not only their own making process’s, but their particular political, moral and ethical outlooks, and how these emerge and in-fact, sometimes define their approach to making Drawings. Despite the vastly different approaches and ideas explored by the four artists in their practices’, what their working process’s share is an extraordinary sense of endeavour, and in some cases a sustained physical endurance in the quest of the making of an image. And although we might historically associate a sense of endeavour and rigour with the Drawing process, we now understand this rigour in a completely different way, with a new emphasis within an intensity of intention with new parameters. A dedicated drive for a very particular image to embody an idea, exist in the world, and communicate amongst the cacophony of others. The territories of image making which Drawing has occupied and assumed an authority in the past, are no longer relevant. Drawing strives to transcend the shifting boundaries of image production and distribution, with a renewed need and ability to assert its sense of meaning. In considering the role and relevance of the medium of Drawing today, what this clearly tells us is that there are understandings that fascinate us, but also allude us. As our relationship to images and ‘other technologies of representation’ change so rapidly, this understanding continuously seems to be slightly out of our grasp. Southern, Jack (2018) during the introduction to the Drawing through Time and Image symposium, University of Gloucestershire. Online magazine dedicated to promoting inquiry into the interactions between the arts, sciences and consciousness, edited by Richard Bright. Role carried out by Lucy Gresley, to observe and record (through writing and Drawing), throughout the symposium in order to contribute to a body of research and critical thinking in response to the key themes and ideas explored. Dr Lucy Gresley is an artist and independent re-searcher, and University of Gloucestershire alumni, with particular interests in artistic practice as enquiry and in the meaning/role of art making, and specifically drawing, within contemporary culture. Gresley has postgraduate training in both research methodology and clinical psychology and is drawn to inter-disciplinary ways of thinking and working. Academic paper by Jack Southern, originally developed for the AAH conference at Loughborough University, April 2017, and Drawing Room (Drawing Research Forum, autumn session), September 2017. Drawing is Political? examined the ever-changing context which determines the politics of how we might look at, see, and understand Drawings today. In doing so, discussed the contemporary relevance of the medium of Drawing in the context of the volume and velocity by which we experience images digitally in contemporary western culture. A fundamental proposition considered whether ‘traditional’ Drawing approaches are merely an antidote to the digital world, or in fact, whether original and authentic drawn responses are now more important than ever. Conference collaboration between Jack Southern and Dr Gill Gibbon, which took place during the Cheltenham Arts Festival at the University of Gloucestershire, June 2017. Seminal and hugely influential book originally published in 1972, based on BBC television series John Berger’s Ways of Seeing; a unique look at the way we view art, and economies of seeing in wider culture. The Photographic Universe and Political Agency conference was hosted by the School of Art, Media and Technology at The New School, Parsons, NY in April 2013. The conference brought together a range of leading practitioners, scientists, theoreticians, historians, and philosophers to consider and reflect on current discussions in photography at a pivotal moment in its history. The unique format of the conference consisted of one-on-one conversations between two individuals from disparate professional and research backgrounds. Victoria Hattam is an Australian born American political scientist. Professor and chair at The New School, Parsons, New York, Hattam is noted for her research on American economy, political development, and on the role of class, race and ethnicity in American politics. Particularly relevant to this article is her has a long-standing interest in investigating the relationship between observation, sub-conscious memory and how political identification is made and re-made. Jean Boyd is an independent researcher and lecturer at the University of Gloucestershire, teaching across a number of courses, including MA Fine Art. Boyd, Jean (2018) Contemporary Experiences of Time. 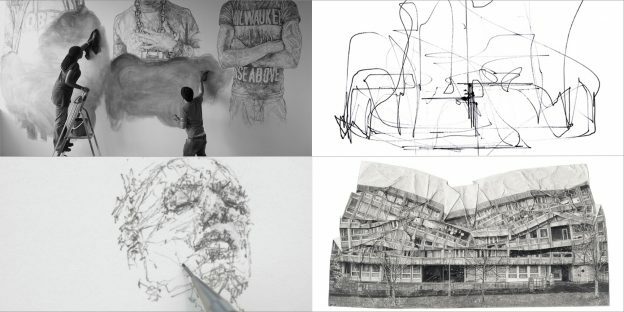 In: Contemporary Drawing Symposium: Drawing Through Image and Time, 22nd-23rd March 2018, Hardwick Gallery, University of Gloucestershire. Straine, Stephanie, curator of exhibitions and projects at Modern Art Oxford, in a video made to accompany the exhibition, A Slice through the World: Contemporary Artists’ Drawings, presented across Modern Art Oxford and Drawing room London, June – September 2018. This exhibition celebrates the sustained power of drawing in the digital age.